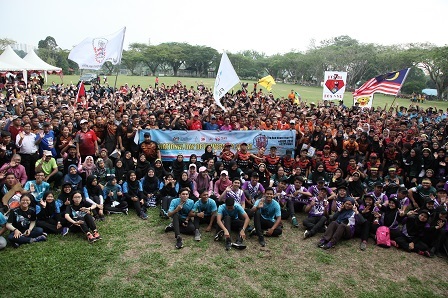 SERDANG, Sept 20 - Universiti Putra Malaysia (UPM) organised the International Day of University Sport (IDUS) programme to inculcate sports cultures among students in an aim to produce productive students. UPM Deputy Vice Chancellor (Student Affairs and Alumni), Prof. Dr. Mohd Roslan Sulaiman, said, the university has always given its supports to the implementation of programmes and healthy activities on campus and that it will continue its efforts in providing good infrastructures and environment for its staff and students. "Academic achievement per say will not guarantee immediate acceptance into the workforce as now, employers require graduates with additional skills and of high capabilities," he said. IDUS was launched in 2016 by the International University Sports Federation (FISU), and it is celebrated on September 20, annually. IDUS is also recognised by UNESCO. "This programme aims to create general awareness among the university and local community in practising a healthy lifestyle by focusing on sport programmes, physical activities and recreation,” he said. 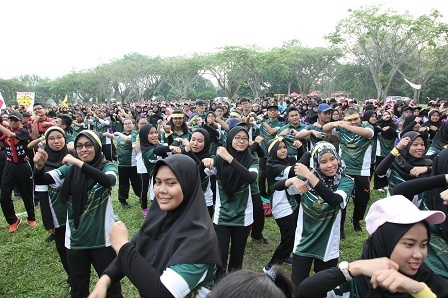 The programme was also attended by UPM students who participated in the aerobics, walkathon and leisure ride activities conducted. Also present were the Chairman of Majlis Sukan Universiti Malaysia (MASUM), Prof. Dato' Dr. Hassan Basri Awang Mat Dahan, Deputy Vice Chancellor (Academic and International) UPM, Prof. Ir. Dr. M. Iqbal Saripan, UPM Chief Librarian, Muzaffar Shah Hasyim and Head of Sports Centre UPM, Dr. Hanafiah Ayub. President of UPM international student, Musheer AlJaberi, said he was happy to be part of the programme as it allowed him to learn about the Malaysian culture. "This is a very good programme because it allows me, as an international student, to socialise more closely with the local students. I hope many more programmes that involve international students such as this will be organised,” he said. Master of Applied Linguistics student from the Faculty of Modern Languages and Communication, UPM, Iman El Kari, said he felt excited with the programme because there were many interesting sports activities. "It is very interesting...cheers from other students make me so enthusiastic to join the aerobics and leisure ride activities,” he said. Meanwhile, 33 UPM athletes who represented Malaysia in 2018 Jakarta Palembang Asian Games last August, received RM1,000 cash incentive handed by Prof Dato’ Dr. Hassan Basri Awang.